one of entertainment’s most distinctive broadcast talents. Big Tigger has earned his place as one of the most distinctive broadcast personalities. Beginning as an intern at WPGC radio in Washington, DC, Tigger’s dedication, business savvy, and love for music are just a few reasons for his rise to success. and recognition as is one of the most sought after media talents. Currently the host of a show that bares his name, The Big Tigger show on V-103 (WVEE-FM) in Atlanta, Tigger connects with millions of loyal fans Monday through Friday from 2pm-6pm. Tigger is one of the most popular media talents, and his audience knows what to expect…a daily dose of the hottest music, the latest entertainment news, and an inside look behind the music. Tigger gets his fans the scoop because his reputation affords him the trust of and access to some world’s biggest entertainers. 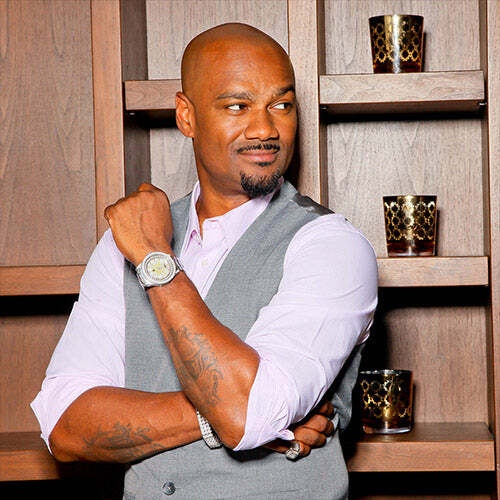 While many people may know Tigger as the face of the longest running, nationally televised hip-hop show on BET; Rap City: Tha Basement and hit show 106&Park, it’s his stellar reputation and hard work has led to numerous opportunities, accompanying successes across media platforms and an ever-growing fan base. Follow with music and you will find Tigger in the mix. Adept at creating opportunities, Tigger is constantly expanding his brand. In 2003, he created and launched Live in the Den with Big Tigger., a three-hour, syndicated show that aired for more than 10 years in 67 markets and 3 countries. He saw similar success with Direct Access with Big Tigger a TV show which earned him an Emmy Award in 2013. A natural in front of the camera and a BET fan favorite, Tigger is the go-to host for Network specials. He has hosted BET Awards Post Party Live from 2009-2012 and 2014, Co-Hosted BET Awards Red Carpet Show in 2012, and was the voice and co-host of the 2011 and 2014 Soul Train Awards. Tigger has also been featured in commercials and on television shows including: a national Reebok commercial and a guest star appearance on The Dave Chappelle Show. Recently, Tigger has taken on silver screen with a role in his first film for UPTv Where’s The Love in which he plays “Rod” & a role in VH1’s Drumline: A New Beat where he plays himself. When he isn’t on the radio, on TV or on a film set, Tigger is in demand by professional sports teams, celebrities and leading consumer brands like Macy’s, CIroc, Coca-Cola, and Nike to bring the music to live events. In addition to being the Resident DJ for NBA’s Atlanta Hawks and in game host for the WNBA’s Atlanta Dream, Tigger can be seen DJing at Shaq’s All Star Comedy Jam Tour, Allstar weekend events for Michael Jordan, as well as countless sports and charity events. Charity is central to who Tigger is. In response to the ravaging effects HIV/AIDS and illiteracy is having on underserved communities, Tigger created The Big Tigger Foundation (BTF). BTF is a non-profit organization dedicated to strengthening diverse urban communities through proactive, innovative programming. Based in the belief that knowledge is the key to improving issues affecting the community, BTF’s focus is two-fold; to increase public awareness of HIV/AIDS by funding educational initiatives targeting prevention, and to improve quality of life for youth and by supporting programs that focus on literacy and self-esteem.